As a twelve-year-old boy the dusty canvas rucksack, a slightly faded grey/green, found long forgotten in the corner of the garage was an inspiration. Reason enough to plan an adventure with my brothers, perhaps bring along a couple neighborhood friends. In those days our street marked the tenuous edge of a ready-to-grow Biggest Little City. Excursions down to the wash or the nearby sagebrush steppe that covered the rolling bottom flanks of Peavine Mountain were a weekly activity. We were fortunately ignorant that our open space, the incubator of our nascent freedom, would someday be developed into tract homes, gas stations and strip malls filled with predictable corporate choices. Our horizon was almost literally infinite, close enough to be true in my adolescent mind, in a way that is still blessedly possible across of much of Northern Nevada. Emblematic of untold stories in which one gathers a kit of provisions and navigational tools for important things, this newly discovered backpack insisted on a special adventure, something a bit more substantial than our typical makeshift wanderings. We all knew where we would go. At the top of our block, visible during any game of street whiffleball was a bigger foothill crowned with a rocky prominence that I can now identify as an igneous outcrop. However to the neighborhood kids it was a possible bandit hideout, a rocky castle with a hidden prospectors’ jackpot or the lair of a thousand rattlesnakes. It was our far northern horizon, a compelling destination. Rucksack shaken out and loaded with a dented Boy Scout canteen, a few snacks and a pair of antique binoculars our expedition hit the sidewalk. The first leg of our journey took us through the familiar neighborhood landscape, up past the pizza parlor and laundromat where we’d often empty our pockets of quarters spent on video games. The open space was just past the small adjacent apartment complex and as the hill steepened our mission began in earnest. At the time my ecological eyes were underdeveloped. The open terrain was merely the setting, the rocky ground with sporadic ground hugging plants that desiccate in the summer sun, the evenly spaced sagebrush twisting our course with weaving gaps, scratching our bare knees and shins as we’d shimmy through. That same soil became boot-caking clay for days after a winter soaking or snowmelt saturation, but on this early summer day the ground was dusty dry and route finding as simple a lifting your gaze to the destination ahead. I think that it’s probable that some of my companions were glad for getting out and expanding our boundaries but perhaps unimpressed with the rewards of our efforts. No strongbox of Comstock silver was uncovered and it was certainly a good thing that we didn’t trip over any of the rattlesnakes that undoubtedly inhabit the mountain. However, my sense of the possibilities was galvanized. I still find that when I set out on any walk, an urban meander, a forest hike or particularly when I find myself cross-country in the open desert, a part of my mind is triggered by subliminal expectations of hidden riches that will reveal themselves if I keep my senses sharp. This is still the neighborhood my family calls home. After all the further wanderings of my life it’s a place I come back to wander. It is still a short five-minute bike ride from my mother’s house to the trailhead. The hillside, so exotic and undeveloped when I was a young boy is public land and access point to an invaluable reservoir of larger pubic space beyond, desired by so many and increasingly valuable to the inhabitants of a growing city that has extended itself to this very edge. The increased sharpness of my ecological vision sees how in the intervening years things have changed. There is a wonderful network of trails, clearly showing the commitment of local volunteers engaged with the Forest Service that manages the land. Fair space is given to different users; mountain bikes, hikers, dog walkers and OHVs. The ad-hoc routes of old jeep roads and rocky ravines is no longer the only way to explore these hills. Another recent change that has caught my eye is a near uniform carpet a yellow that doesn’t match the mental picture ingrained into my imagination during my formative years. A fast growing grass inadvertently introduced to the Intermountain West has firmly established itself. 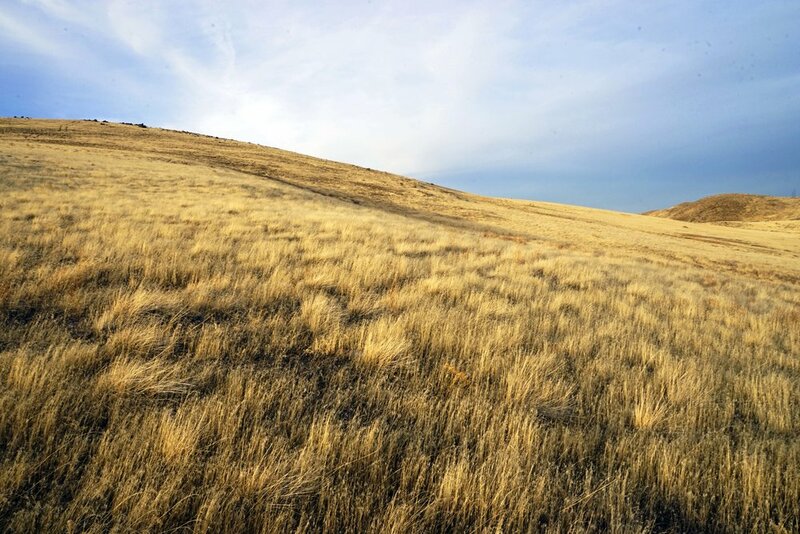 The formula is simple; cheatgrass (Bromus tectorum) a plant from Eurasia is an annual, resprouting each year and growing quickly, smothering the more reserved locals. Being highly flammable and fond of burning, fire wipes out the established shrubs like rabbitbrush and big sage. Fire frequency has increased substantially and the natives don’t have the opportunity to come back easily when the cheatgrass returns first. This yellow carpet is what I encounter where was once a sporadic ground cover of subtle but interesting herbs and the maze of sagebrush that has largely vanished, remnants in areas not recently burned. This story is playing out throughout the Great Basin and beyond and the ecological consequences are heartbreaking. Habitat for threatened species like the greater sage grouse is diminishing and the overwhelming newcomer contributes precious little back to the ecosystem relative to the native plant community. Not even the rangy cattle raised in the region can eat the plant and many ranchers share the concern about its proliferation. The seminal conservationist Aldo Leopold said, “One of the consequences of an ecological education is that one lives in a world of wounds”. My blissfully ignorant adolescent self couldn’t see the havoc caused by our foibles, our carelessness or our greed the way I have no choice but to see it now. However I would never trade the beauty that my engagements with nature and ecological stories have shown me, although I occasionally envy the willfully ignorant. Artemisia tridentata, commonly referred to as big sagebrush or my preferred Great Basin sagebrush is the fitting choice as Nevada’s state flower. Many of the one thousand wide valleys of the Great Basin were filled with inland seas 12,000 years ago. Now many of them have waves of the softest green leaves, evenly spaced sage stretching beyond the curvature of the globe. Don’t expect a dramatic showy inflorescence. Like much about the desert there is some subtlety that demands our attention, the clusters of small yellow flowers stretch upwards in the late summer enough to shift the tone of a whole basin to those with sensitive eyes. What is not subtle is the smell of the volatile leaves combined with the floral aroma when a September thunderstorm sweeps the Nevada rangeland stirring the countryside. Each season as cheatgrass fire cycle is creeping across the landscape we will have less of this joyous experience and fewer of the delicate flowers. A fire maybe twice in a century was once typical, more than twice a decade is common now. The loss of a billion plants might be a gross understatement. Each of those innumerable plants that remain may produce a million tiny black seeds. Mostly borne on the wind they may not be long lived, succumbing to the frequent fires or struggling to compete when they do sprout. Nature provides infinite opportunities for redemption. I can hope the land holds the memories of my favorite plants encapsulated in the seedbank. Meditative riches or quirky ecological surprises are the expected and welcomed reward of my rambles. This afternoon I took advantage of the mild January we’re experiencing to go for a mountain bike ride, the winter mud and clay that would encrust my tires tamped down by dry air and unseasonably sunny skies. My mind predictably wandered to hidden treasures stimulated by glimpses of 100 year old mine shafts and adits clustered around ridges of andesite. Mysterious lodes were removed the forgotten value and content possibly to be rediscovered by digging into the archives of the University Nevada Reno, Mackey School of Mines. The trail traversing the modest tailings piles produced my mule power and individual sweat reflecting long forgotten desires. However the land does hold a buried treasure far beyond my 12-year-old imagination. Countless seeds representing the vegetative history of the land are stored beneath the surface hoping for the opportunity the return. Sign up with your email address to get blog posts when they come out. Sign up with your email address to get our Nature Walk Podcasts.